Here's an easy idea to outline your garden borders and make them look simple and rustic but full of class: natural stone borders! Just gather up as much stone as you can, clear out your border area, lay the stones and your borders are done. They do require a little edging maintenance - grass likes to grow between the stones. 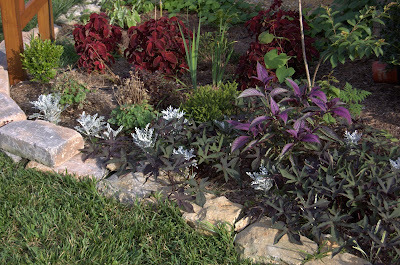 A weed control fabric underneath the stones - or thick newspaper - may help to reduce the weeds. I prefer the newspaper since it will degrade and feed the soil. The weed control fabric will gather weed seeds and roots will grow right through the top of it which makes it difficult to weed. More photos of the stone border can be seen at my main blog by clicking on the picture below or the link provided above!